Thousands of African migrants rescued crossing Mediterranean to Europe. 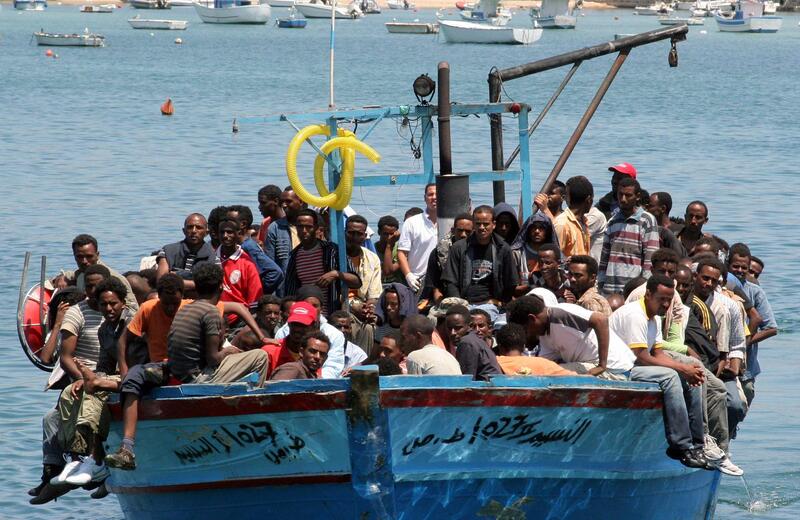 Would-be immigrants arrive on a boat in the port of Italy’s southern island of Lampedusa late on July 31, 2008. The humanitarian crisis in the Mediterranean continues unabated. Italian authorities intercepted, and rescued, nearly 3,700 migrants trying to cross over in smugglers’ boats on Saturday, the Italian Coast Guard said on Sunday. “The [Coast Guard] said 17 different rescue operations were carried out Saturday after smugglers took advantage of calm seas and warm weather to move the migrants out of Africa on motorized rubber dinghies and fishing boats,” the Associated Press reports. Unrest in northern Africa, including increasing lawlessness in fast-deteriorating Libya, along with mild weather is propelling a surge in migrants trying to make the perilous journey across the Mediterranean to Europe. Italian authorities are expecting 200,000 immigrants to arrive in the country this year. The relentless wave of migrants has caused alarm among European leaders, who have beefed up patrols and rescue operations in the area and appealed for greater cooperation in rooting out people traffickers. So far this year, at least 1,750 people have died trying to make it across the Mediterranean to Europe—20 times the number during the same period last year, according to the BBC.